Product prices and availability are accurate as of 2019-04-23 16:26:55 UTC and are subject to change. Any price and availability information displayed on http://www.amazon.com/ at the time of purchase will apply to the purchase of this product. Waterproof and Energy Saving 1.The waterproof light strip can be immersed in water and work as normal. (Battery case can't immerse in water.) 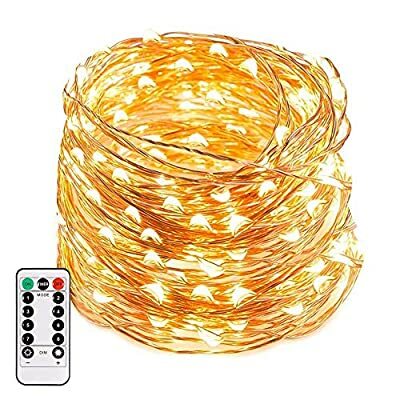 2.With low consumption of the starry string lights, 3 new AA batteries can work 50-60 hours constantly. Package Included 1 X TryLight LED String Lights with Battery Box 1 X Remote Warranty 1.The product was fulfilled by Amazon; you can get your parcel faster. 2.Get solutions from the seller in 24 hours if you have any questions about the product. 3.Product enjoys 365 days quality warranty, except artificial damage. Smart Remote: Control the fairy light with 8 modes and adjust lighting brightness by battery box or remote control. The remote can meet different requirements within 10 meters. Waterproof: Both copper wire (IP65 grade) and battery case (IP44 grade) are having high performance in water resistance. Idea to decorate the indoors and outdoors. Battery Powered: Powered by 3 AA batteries (not included), lightweight and easy to carry the string lights to anywhere you want. Timer Feature: Once set the timer function, the lights will constant lighting 6 hours every day. One-click for cycle use, save time and energy. Safe and Reliable: CE, FCC and RoHS certification provide more safety warranty. 4.5V low voltage creates a security environment to human beings.